Persian sturgeon (Acipenser persicus) is a critically endangered species, mainly due to overexploitation for its caviar. The permanence of populations of this species in the Caspian Sea is fully dependent on restocking programs. Accordingly, it is considered as an interesting target for aquaculture for both restocking and commercial purposes. In addition, as a Chondrostei, it exhibits one of the slowest rates of molecular evolution among vertebrates and is propounded as an excellent candidate for phylogenetic analysis and evolutionary biology. 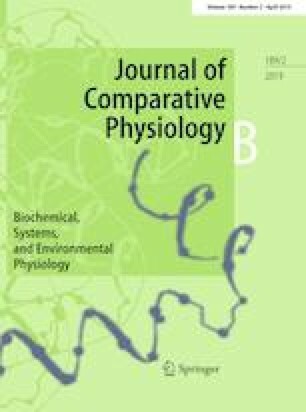 In this study, the early ontogeny of some key digestive enzymes precursors was determined at molecular level, aiming to obtain basic knowledge on the acquisition of digestive capacity of this species, and at the same time, to advance in its phylogenetic status from the point of view of digestion. For this purpose, A. persicus cDNAs for β-actin (actb; used as an internal reference gene), bile-salt activated lipase (cel), trypsinogen 1 (try1), pepsinogen (pga), and gastric proton pump (atp4a) were amplified and cloned, and their subsequent expressions were measured by quantitative real-time PCR during the first 34 days post hatch (dph). Two isoforms for pga and at least six for try1 were obtained in this study, probably due to the additional genome duplication which sturgeons suffered along evolution. Phylogenetic analysis of the deduced amino acids sequences from the studied genes demonstrated that this species has a close evolutionary distance to Holostei, coelacanths, and tetrapods, including amphibians, reptiles, birds and mammals. According to our results, expression of all the genes increased gradually over time and reached maximum levels around 18 dph. This pattern, which was comparable to length and weight data, could indicate that around 3 weeks after hatching, the digestive capacity of the Persian sturgeon changes from larval to juvenile mode. The online version of this article ( https://doi.org/10.1007/s00360-019-01215-x) contains supplementary material, which is available to authorized users. This work has been financed by the Iran National Science Foundation, Vice-Presidency for Science and Technology, Presidency of the Islamic Republic of Iran under grant number 90002809 to Dr. F. Paykan Heyrati, and by projects AQUAGENOMICS (CDS2007-00002) and RIDIGEST (AGL2011-23722), with FEDER/ERDF contributions, from the Spanish Ministry of Economy, Industry and Competitiveness (MINECO) to Prof. M. Yúfera. We acknowledge the Shahid Marjani Sturgeon Breeding Center, Golestan, Iran, for providing the larvae for this study. Besides, we would like to thank Samaneh Nazeri (Ph.D.) for her valuable assistance in sampling procedure. N. Gilannejad was supported by a doctoral fellowship (BES-2015-071662) from MINECO (Spain). Gesner J, Freyhof J, Kottelat M (2010) Acipenser persicus. The IUCN Red List of Threatened Species 2010, e.T235A13043839. https://doi.org/10.2305/IUCN.UK.2010-1.RLTS.T235A13043839.en.